Participants in this experiment are given an endowments of "tokens" that may be kept or contributed to a public good. The value of a token kept is typically specified to be greater than the "internal return" that the individual receives from making the contribution, so there is a private incentive not to contribute. However, contributions produce an "external return" to the others in the group, and such contributions are socially optimal when the total benefit to all exceeds the value of keeping a token. 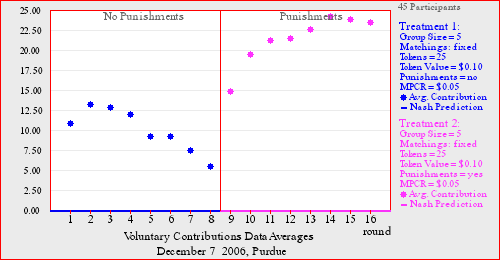 Contributions may increase dramatically when participants can administer costly punishments to others. The public goods game has fascinated social scientists because the conflict between social and private incentives provides a platform for studying altruism, reciprocity, demographic effects, etc. The fear that "free riding" may generate low levels of public good provision has been discussed since Adam Smith's famous observations about street lights. For references and a summary of related experimental economics research, see Chapter 14 in Holt (2006) Markets, Games, and Strategic Behavior, Addison-Wesley.